Social Media Get The Right Stuff To India's Flood Victims : Goats and Soda Waters rose as high as two and three stories in the state of Jammu and Kashmir. People were trapped. They needed supplies, and #jkfloodrelief came to the rescue. 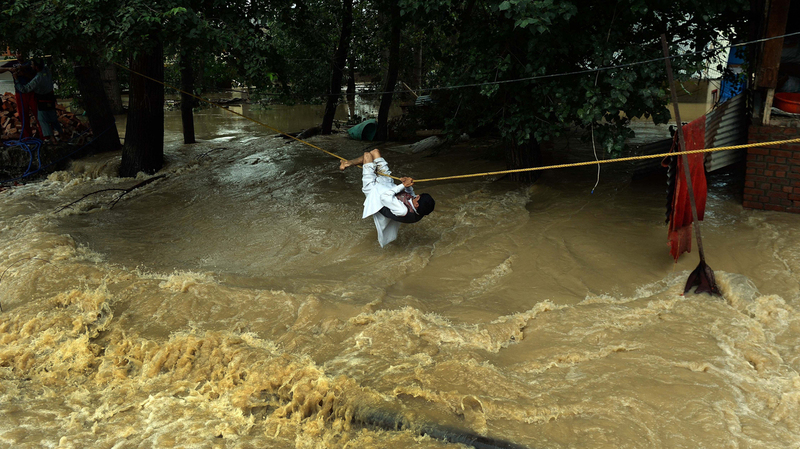 An Indian Kashmiri man in Srinagar uses a rope to cross over floodwaters in early September. Any volunteers nearby? #SOS #JKFloodRelief "@ProudHindi: her child is ill Zara Mirza Nr bone n joint hosp. Right 2 bubbles school @Raheelk"
@takhtsulaiman @tkwmag "if someone you know is waiting for rescue, send tweet with #jkfloodrelief #SOS to @adgpi Info passed on to rescuers! When the floods hit the state of Jammu and Kashmir in the first week of September, Delhi resident Raheel Khursheed was preparing to visit his hometown, Anantnag. "By the middle of the week I realized that it's not going to stop raining through most of the week, and I started to put my plans on hold," says the 31-year-old New Delhi resident, who directs news, politics and government at Twitter India. "By Friday, Anantnag was flooded." Luckily, his family was safe. But as he followed the story from afar, it became clear the flooding was unprecedented. The water in the capital city of Jammu and Kashmir, Srinagar, was two or three stories high. Tens of thousands were reported to be trapped, unable to escape from the rising waters. The official number of deaths rose to 277 Friday, and more than 200,000 people have reportedly been rescued. "It was clear that the problem was way bigger than anyone expected," recalls Khursheed. So he started a social media campaign to organize a nationwide relief effort to aid the flood victims in his home state. Together with a colleague and a few friends, he created a website called JKFloodRelief, a Twitter handle and the hashtag #jkfloodrelief. Then they put out calls for people to donate. They reached out to people in Kashmir to list the items they needed most. Food, medicine, insulin, sanitary napkins, baby formula, and blankets were among them. By using social media, they were able to regularly update their list. Once the Indian company Emami donated a large number of sanitary pads, Khursheed says, "We didn't need pads anymore, so we took it off the list." People from around the country responded to the request for aid. They reached out to the JKFloodRelief team on Twitter and set up collection points across major cities like Bangalore, Chennai and Mumbai. The team in Delhi had already set up collection centers in the city with the help of a growing number of volunteers, many of whom found the team through social media, says Khursheed. But it wasn't all about social media, he admits. He and his friends had to tap into their personal network, as well. Khursheed reached out to someone he knew at the Indian airline Indigo to seek help shipping the donations to Kashmir. His friend Vidya Krishnan, a health reporter for the newspaper Mint, reached out to people she knew at the biomedical company Cipla for medical supplies. Similarly, the group worked with nonprofit organizations like Goonj and Sajid Iqbal Foundation, which have previously shepherded distribution of relief aid. "So there, social [media] didn't come into effect that much because [cellphone] networks were down," says Khursheed. Still, it's a groundbreaking effort that used crowdsourced information to create what Krishnan and Khursheed describe as a "humanitarian FedEx." And that's not just self-promotion. Basharat Peer, a Kashmiri journalist just returned to Delhi after working as a volunteer in his hometown, agrees: The group, he says, effectively used "social media for raising awareness, getting people and corporations to donate relief materials."